From left: Ashley Neufeld, Kyrstin Gemar and Afton Williamson. A friend says they called her in distress and mentioned water. (CNN) -- The bodies of three students at a North Dakota university who had been missing since Sunday were found Tuesday in a vehicle submerged in a pond near their school, police said. The discovery came Tuesday afternoon after a search team found tire tracks leading to a stock pond for cattle five miles northwest of Dickinson, North Dakota, Lt. William Leach of the Stark County Sheriff's Office told CNN. The investigators found a white 1997 Jeep Cherokee with California tags containing the bodies, he said. Foul play is not suspected, he said. 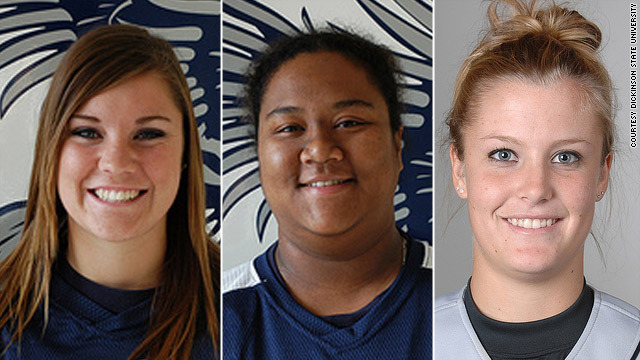 The Dickinson State University softball players -- Kyrstin Gemar, 22, a senior who owned the car; Afton Williamson, 20, a junior; and Ashley Neufeld, 21, a senior -- had last been reported seen about 10:45 p.m. Sunday, according to CNN affiliate KXMB. At 11:18 p.m. and 11:19 p.m., teammates received two distress calls from the women during which they mentioned water and a lake, said Connie Walter, Dickinson director of university relations. After the calls ended abruptly, the teammates contacted law enforcement and the search began. At 12:07 a.m. Monday, a "ping" on a tower from one of the students' cell phones was traced to a cell tower five miles northeast of Dickinson and authorities concentrated their search in that area, officials said. Watch the women's coach recall "awesome person"
Authorities have not identified the owner of the pond, which is 25 yards by 25 yards in area. It was not known how the students ended up in the stock pond, which is on private property and is part of a farm and cattle operation, Walter said. Dickinson Police Officer Thomas Grosz told ABC's "Good Morning America" that authorities believed the women may have gone out to a lake to stargaze. That would not have been unusual, Gemar's father, Lenny, told ABC. Dickinson, he said, is a "pretty small town" without an active nightlife. He said the women routinely drove to a lake to stargaze and chat. Williamson and Gemar were from California, while Neufeld was from Canada, according to KXMB. Dickinson is almost 100 miles west of Bismarck, North Dakota.